For a while now, local photographer Harry Taylor has looked to the rich history stretching the banks of the Cape Fear River as a muse for his photography. In 2012, Taylor presented “Rio Jordan,” his 621N4TH solo exhibition featuring portraits and landscapes inspired by the culture and terrain of the Cape Fear region. Last year, Taylor followed up by installing a greenhouse at the Cameron Art Museum made entirely from glass plate negatives depicting local civil war history, much of which revolved around the river. This Fourth Friday, the Gallery at SALT Studio, 805 N. Fourth St., presents “Requiem: Views from the Cape Fear,” the latest chapter in Taylor’s ongoing series covering the Cape Fear. Taylor will debut new tintype photography created in the antiquated nineteenth-century process of wet plate collodion, as well as large-scale archival prints. The solo exhibition opens with a public reception 6 to 9 p.m. Feb. 27, in coordination with Fourth Friday Gallery Nights, a monthly self-guided art crawl throughout downtown Wilmington’s art studios and galleries organized by the Arts Council of Wilmington and New Hanover County. “Requiem” hangs through April 17. The Brooklyn Arts District (BAD) is in the midst of a resurgence: Condos are rising, sauces are reducing, beer is flowing, and the arts are arting. These are the cornerstones of big cities’ hip districts, which is why the timing couldn’t be better to welcome artists from the NYC borough of Williamsburg, Brooklyn, to Wilmington’s northside borough, BAD. They’re coming to cast shadows across The Gallery at SALT Studio (805 N. 4th St.). “Haunted” consists of a multi-layered photographic collaboration by WAX+VINE, made up of husband and wife creatives Scott Irvine and Kim Meinelt. They created the 24-photo collection exclusively for their SALT exhibit after receiving an invitation from the studio’s proprietor Kelly Starbuck—who also happens to be a a long-time friend of the couple. Mirroring Irvine and Meinelt’s collective exhibition persona, “Haunted” blends soft and hard textures—like lead, cotton, concrete, leaves, bone, and feather—to produce a pressed and tangled amalgam of illusory scenes. Though not scary, the imagery captivates and completely avoids color. “I didn’t want ‘Haunted’ to have a negative feeling to it,” Irvine states. “It’s an interesting word, like an echo.” Irvine rejects terms like “darkness” that paint black-and-white photography in a bad light. “It’s about finding those weird moments in the mundane where something is really interesting that’s maybe overlooked,” he says. Describing the duo is a lot like explaining the juxtaposition of yin and yang: Their presence is magnetic and surreptitiously affects the other. Irvine is reserved; he prefers to pull back from subjects and takes comfort in a wide field shot. Meinelt is the opposite; she’s outgoing and approaches people and photography through a macro lens. Their introverted-extroverted energies find harmony and create a balance in the relationship while amplifying personal style. A fan of Irvine’s work five years prior to meeting him, Meinelt owned one of his pieces. She took it down when he visited her for the first time. After attending the North Carolina School of the Arts in Winston-Salem for set design and scenic painting for two years, Meinelt began working as a freelance designer and painter in NYC. In 1993 she crossed paths with designer Eileen Fisher. After two years of designing window displays for Fisher, Meinelt joined full-time as the creative concept director, a title she still holds today. Three months after they met, Irvine and Meinelt traveled to Southeast Asia, a trip foreshadowing their foray into collaborative photography; they only packed one camera. The creation process for their new show pays homage to their trip and places two opposing techniques together with as little resistance as possible. Preparing for “Haunted” proved a visually taxing experience for the pair. “For every one that worked, there were a hundred that didn’t,” Irvine explains. Wanting the pieces to evolve organically, they spent two months sorting through existing photos, both digital and film, all from their travels, neighborhood and natural history museums. Hundreds of images were uploaded to the computer and fused by Photoshop until a unique combination surfaced. “We really [tried] not to be too precious about it,” explained Meinelt. “It feels really important to me. I feel like it’s about having fun.” Meinelt, who is no stranger to serious design editing, spent a lot of solo time flipping through images for shapes and shadows and noting how artifacts related to each other in positive and negative spaces. In addition to “Haunted,” a portrait collection by Irvine is on display. Reminiscent of his roots, all of the portraits were developed in his darkroom and feature a discontinued sepia tone that he will one day re-create. The subjects range from friends and neighbors to artists and well-known musicians, like Interpol, Amanda Palmer (Dresden Dolls), Ian Astbury (The Cult), and Nick Zinner and Karen O (Yeah Yeah Yeahs). The selfie has been a cultural fascination for centuries. From the early cave painters at Lascaux to today’s camera-toting/Instagram culture, we are consumed with preserving self-depictions. Although most people’s homes are filled with pictures of themselves and family members, the power of portraiture is often marginalized. Austin Young’s appreciation for his subjects reveals itself to be unparalleled. He crafts photos that fully embody his muses and shed light upon the accessories and the soul of life. Finding pop-culture as a source of inspiration, the developing artist would sit in his room, ingraining the larger-than-life likenesses of icons like Debbie Harry and Siouxsie Sioux into his brain. He channeled a Warhol-like fascination in the God-esque portrayals of celebrities, which in turn illuminated a lifelong passion—a love of iconography. Exposure to a world that existed outside the confines of Reno titillated the young man. So, he moved to big cities and traveled the world, from Paris to LA. Young made a name for himself by encapsulating subcultures along the way—generating renderings of drag queens, performance artists, and the like. Living in New York in the early ‘90s, he often would visit various clubs to capture its life. Yet, portraits evolved from his experiments. He felt their intimacy would resonate no matter what content one portrays. “It’s a big responsibility to be a portrait artist because you have to capture someone in a way that represents them,” Young elaborates. With several compelling bodies of work, Young’s work makes social commentary, too, like with gender stereotypes. His pieces subvert the traditional constructs society has set forth. Instead, he illustrates genderless subjects.“[It] really calls into question our concept of beauty and identity,” he describes. Although simple, his photos reflect a bonding relationship between a model and photographer, each artists in their own rights. He highlights the reflective nature ably allowing him to reveal the complexities and emotions of his muse. Through his collaborative “Tranimal Workshops,” he gathers artists, participants, and various materials in both gallery and museum spaces. Models, transgenders or otherwise, are invited to transform into art themselves, whether they morph into a creature straight from Chernobyl or pose in a Glamour Shot fashion, but have a raven growing from a black beehive. In addition to his portraiture, Young is the co-founder of the art group, Fallen Fruit. With fellow artists David Burns and Matias Viegener, he began mapping fruit trees that were growing over public property in LA. The collaboration has expanded to include public projects, site-specific installations and happenings in various international cities. Although his work for this collective centers on fruit, Young’s whimsical muses, eye for color and post-modern pop-art style remain evident. Young’s photographs have not only caught the attention of the art world, but also local photographers and gallery owners of Salt, Kelly Starbuck and Horace Long. 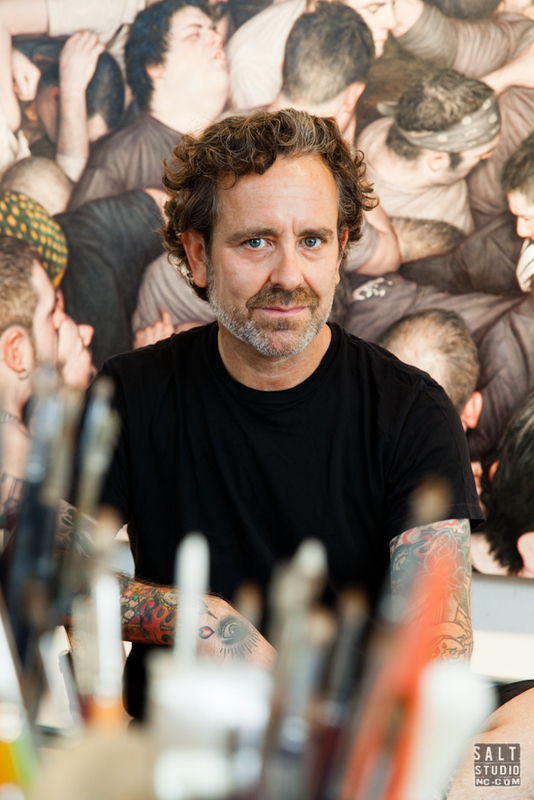 Featuring a small retrospective of Young’s work, “Portraits” is his first solo art show in North Carolina. Through his specific style, Young has produced photographs of Debbie Harry from Blondie, Siouxsie Sioux, Margaret Cho, Leigh Bowery, Tori Spelling, Sandra Bernhard, almost all of the “Rupaul’s Drag Race” queens, and hundreds more. This exhibition will open with a reception on April 25th from 6 p.m. to 9 p.m. and will be on display through May 17th. S.A.L.T. Studio is located in the historic Modern Baking Building. S.A.L.T. Studio • 805 N. 4th St. Reception: April 25th, 6 p.m. – 9 p.m.
Mon. – Fri., 10 a.m. – 6 p.m.